Five Star Home Inspector, Chris Brown the owner has over 35 years of construction experience, he is North Carolina and South Carolina Certified Home Inspector, Certified National Building Inspector, Certified Mold / Mildew / Air Quality, Member NC Licensed Inspectors Assoc., NC General Contractor / Homes Builder of the Year, 12 Time Customer Satisfaction Award Winner. Five Star Home Inspection has a fully qualified and professional staff to handle your Huntersville Home Inspection. If you want the best home inspector in Huntersville look no further than Five Star Home Inspection. 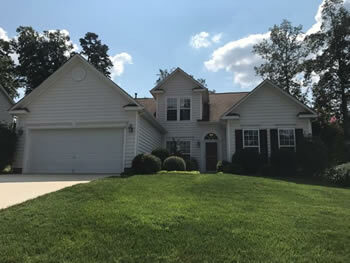 Five Star Home Inspection serves the Huntersville, NC area. Our expert home inspection team provide full service home inspection for your Huntersville home. We primary inspect for Lot Conditions and Grounds, Foundations and Porches, Basement / Crawl Spaces, Structure / Roofing, Attics, Garages, Carports, Exterior Surfaces and Components, Windows and Doors, Driveways and Sidewalks, Air Conditioning System, Heating System, Plumbing System, Electrical System, Fireplaces And Chimneys All Living Spaces and Common Areas. If you are preparing to sell your home or buy a Huntersville home contact us today at 877-766-3148 for a full home inspection. Click here to schedule your Huntersville home inspection today! Very professional and helpful. Very thorough inspection. High level of professionalism and honest. Exactly what I was looking for with a house under construction. They did a fantastic job. They scheduled quickly and we had the report in less than 24hr. We also received an electronic home binder that saves all of the info their for us.wonderful company and service. The service was outstanding. Kris is very knowledgeable. Straight forward and no nonsense. We used Kris to do a pre inspection on our home and the home we are buying. Will recommend 5 Star Home Inspections to everyone. Five Star Home Inspection was great. They were prompt and efficient. Scheduling was easy. When there was a question on an issue that was found, the inspector called me back promptly to explain the issue. Not only that the owner followed upas Well.. I recommend them highly and use them often. Their service and pricing can&#8217;t be beat! Very professional and thorough during this inspection. An expert in recognizing, documenting, and explaining in detail the problems found in a home and the need to repair. Five Star Home Inspections is an exceptional company. The inspection was very detailed with clear illustrations of items in need of repair. The companys RecallChek program flagged the Thermador Dishwasher as a recall stating that the power cord can overheat causing fires and potential property damage. This dangerous situation would never have been caught in a typical home inspection and I am very thankful for the thoroughness and attention to detail that this company provides. Excellent technical knowledge, great attention to details, and dependable services! We are very satisfied with their services and highly recommend Five Star Home Inspections to home buyers in the area. Great services and wonderful people! Always accommodating, friendly and professional. Lake Norman Mike uses them all the time! They have done multiple inspections for me on a number of properties. They stand behind their work, the inspectors are very professional and detail oriented. The reports are generated quickly and provide the detail needed in each transaction. I have enjoyed working with them over the years, and will continue to use them in the future! Kris was an excellent source of information for my buyer. He was professional and helpful. It was so easy to schedule my inspection, and the report came just 24 hours after the inspection. I would recommend 5 Star Home Inspections and plan on using them again. Our inspector, David, did a very professional and thorough inspection. The report was very detailed with excellent pictures of all items noted. The company responded promptly to all requests, and utilizes technology well to post reports and payments. Five Star also offers free additional features, such as Appliance Recall Check and Home Binder Maintenance System. Our team closes over 200 homes a year, and always rely on Five Star to provide our clients with an in-depth home inspection. Not once have they under delivered, and our clients walk away with knowledge and peace of mind about their new home. 5 star home inspections certain lives up to its name! Kris inspected my second house back in 2014 and did such a thorough job that I wanted to use him for my next home (closing in December 2017). Again, he did another very detailed inspection. I would recommend him to anyone I know! Kris Brown and his team have consistently done an awesome job on my clients inspections over the last 8 years. I have been a broker for over 33 years and Kris, by far, is one of my favorite inspectors. Could not ask for more. One of the most professional home inspection experiences I have had in 15 years of business as a real estate pro. Thanks David Hill; you will be hearing from us again! Kris and the whole team at Five Star Home Inspections are so great to work with! From the very beginning they make scheduling inspections as easy as can be, and they have great communication with everyone involved in the transaction. They are very thorough in their inspections, make their reports easy to access and simple to read, and get everything done in a very prompt manner. In addition to that they always go the extra mile to look out for my clients best interests and are never too busy to answer any questions that my clients have either at the inspection or over the phone when they get the report. Kris is also really great at explaining things in a way that my clients can clearly understand which makes the whole process so much smoother. I would highly recommend Kris and his team at Five Star to everyone in need of a thorough and reliable home inspection company! Five Star Home Inspection is the right name for this business as I am giving them a Five Star review! Working with them on my home inspection was easy and they were so thorough! I was impressed. Plus, the included termite inspection and subscription to Home Binder provided additional benefits I value! Top notch! Very professional, on time, goes over the top to educate and inform areas of concern. they are the best! What a breath of fresh air dealing with Five Star from the first contact, inspection,and receiving the report not a bump in the road. Truly appreciate the professional service both in the office and in the field. Highly recommend! Thank you very much! I have dealt with several home inspection companies and inspectors over the years, and I would highly recommend your company to family, friends, and colleagues in the future. David Hill was outstanding and answered each and every question I had, and showed me where all of the major electrical, heating/cooling elements, water heater, etc. in the home as well as how to operate and and do the annual/season maintenance on those items. I was very impressed with his professionalism, customer service, and knowledge in this process and appreciate it immensely being a homeowner in a new state. Five Star really went above and beyond for a client of mine. She had already closed a few months and thought she had squirrels in the attic. She had an extermination company come out to inspect and they told her she had a $1500 worth of damage to repair. They wrote her up an estimate and went on their way. She called me because she thought it would have been noted on the inspection. I called Kris and he sent the inspector out to the house to reinspect, at no cost to the client, and found that there was absolutely no damage at all! That company was completely trying to scam her out of $1500! I really appreciate that level of care for customers! Thanks Five Star! A Big Thanks to Kris Brown of Five Star Home Inspections for a going above and beyond today! Kris took it upon himself to repair a broken PVC pip under a house so that he could complete our inspection and get the water tested! Kudos Kris! Thanks for diving all the way to Mocksville for us! Kris was onsite when I arrived and that was approximately 10 minutes before he was scheduled to be there. He took his time and answered any questions that I had. He explained everything to me in great detail. I would recommend his services to anyone who was interested in getting their home inspected. Kris was prompt, courteous and professional. His report was well prepared, easy to read, and included color photos of fair and defective findings. I was very pleased with Kris and his thorough inspection. Kris expertise in construction was apparent from our first conversation. He was extremely knowledgeable, attentive to detail, and able to explain to me in layman terms why my home was being built the way it was. None of the items that Kris noted in his inspection report was debated by the builder. In fact, many of them would have never been brought to light had Kris not been so meticulous. If professionalism and thoroughness are high on your priority list for a home inspector, look no further. I would hire Five Star Home Inspections in a heartbeat to inspect my next home! Kris is a very personable, detailed orientated, very knowledgeable about the home inspection business. I have been doing business with him for years and trust his input and knowledge. I will continue to recommend Kris in the future every opportunity I have. As a real estate professional in the business for over 27 years I have used several home inspectors! Kris is by far one of the most qualified inspectors I have used. One of Kris outstanding qualities is his patience and detailed explanations to all buyers/sellers with questions. Agents he will do a great job and not upset the deal with his opinions....he states the facts and allows both parties to respond. Just an all out professional! Give Kris a try you will not be disappointed! For the past 5 years I have known Kris, I have always been impressed with the true detail he has displayed as a builder and now a home inspector. Honesty, Integrity, but most of all a true commitment to his profession. He is not only just a talented builder and home inspector, but a true benefit to any buyer for new construction or resale. He knows what to look for and not only that but he treats each home like its his investment. Each inspection he has done for me has always been prompt and efficient. The same with turning in a detailed colored report in a timely manner. There is no question about it, Five Star Home Inspections will always be my first choice when it comes to my clients. Service and Experience is Key!! Kris is a true professional and an expert in his field. Being a experienced builder, he knows new construction and how to locate any shortcuts another builder may try to take. He focuses in on the true bones of the home and typically does not address cosmetic issues. His reports are timely and easy to read. My clients are very happy with Kris expertise and he has on numerous occasions called their attention to items that would have never been known had we not used his services. I would definitely recommend Five Star Home Inspections Inc and would not use anyone else, especially for new construction or resale. He knows his business. Kris Brown is not only a pleasure to work with but he takes his business seriously with integrity and customer satisfaction at the top of his priority list. He has great attention to detail and is extremely thorough. His knowledge of the construction business and dedication catapult his inspections to the top. He is a true professional and I would highly recommend Kris at any time and will continue to utilize his services indefinitely. I have been using Kris Brown for my clients Home Inspections for the last several years. He is a general contractor, very knowledgeable, honest, reliable and goes beyond expectations. I highly recommend Kris and Five Star Home Inspections if you are buying or selling. Please complete the simple equation to submit. "Service The Shines Above the Rest"